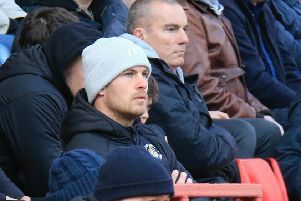 There has been a distinct lack of home comforts for Newport County at Rodney Parade this season, with the Exiles supporters yet to cheer a league victory. The hosts have had nine chances in which to do so, but have returned just four points from a possible 27 after four draws and five defeats. In fact the run stretches to March of last season, when County beat, you guessed it, Luton Town, 1-0, as they went on to lose three and draw one of their final four matches. They did recently lift the gloom with a 4-1 victory over Conference North side Brackley in the FA Cup, but league-wise, it’s now 13 games and eight months without a home triumph. Newport had started the season with former England international defender Terry Butcher in charge. However, after just 12 games, and a single win at Carlisle, overseeing eight defeats, he was sacked hours after the club changed ownership, with County’s Supporters Trust raising the £195,000 target needed to complete a takeover. Although Sheridan hasn’t been able to rectify the club’s home record, with two draws and a defeat so far, Newport’s form has picked up markedly, with a 2-0 success at Wycombe followed by a 4-1 thrashing of Bristol Rovers the stand out results. The former Irish international has seen his side put together an eight game unbeaten run too, although they have drawn their last four league matches including a disappointing 0-0 home stalemate with fellow strugglers Yeovil. Defender Matt Partridge can’t understand the lack of home wins though as he admitted to the South Wales Argus: “I haven’t a clue why we haven’t won at home. “Obviously we go out every week and give it our all and the fans have kept supporting us and that is a big help. Newport were in action ahead of the loan window closing yesterday, bringing Swansea City’s Scottish U21 striker Oliver McBurnie in for a month and he will be in the squad for tomorrow’s clash. Team news: Luton might will give both Luke Wilkinson (thigh) and Magnus Okuonghae (foot) every opportunity to be included, while Nathan Doyle is back in training too although might have to make do with a place on the bench. Pelly Ruddock Mpanzu (ankle), Dan Potts (hamstring), Luke Guttridge (knee) and Stephen O’Donnell (hernia) remain absent though. For Newport, Sheridan is hopeful that defender Scot Bennett will be fit to face the Hatters. The centre-back, on loan from League Two rivals Notts County, was forced off after a blow to the ribs in Tuesday’s 1-1 draw at Oxford United. Top scorers: Hatters: Cameron McGeehan, Jack Marriott (8). Exiles: Scott Boden, Lenell John-Lewis (5). Man in the middle: David Coote - official has taken 12 games so far this year, with five Championship matches, showing 51 yellows and two reds, both dismissals coming in the same game. Last season he took 29 games, showing 116 yellows and four reds, including Luton’s 3-2 home defeat to Wycombe, the only other time he has refereed the Hatters. Assitant referees are Mark Derrien and Craig Taylor, with Richard Hulme the fourth official. In charge: John Sheridan. 51-year-old who had a long playing career, making over 600 appearances for the likes of Leeds United, Nottingham Forest and Sheffield Wednesday, scoring the winning goal in the 1991 League Cup Final at Wembley. Also featured for Birmingham, Bolton Wanderers, Doncaster Rovers and Oldham Athletic, while won 34 caps for the Republic of Ireland, going to two World Cups and one Euro Championships. Became Oldham boss in 2006, leaving in March 2009, although was back in the hotseat four months later when he joined Chesterfield where he won promotion to League One. Relegated back to League Two the following season despite winning the Football League Trophy and left the club in September 2012. Appointed as Plymouth manager in January 2013, leading the Pilgrims to the play-offs last season, where they lost to Wycombe. Left the club in May after expressing a desire to return to the north of England for family reasons, before being named Newport boss in October of this year. View from the opposition: John Sheridan talking to the Newport official website: “I believe the last win at home was against Luton, so it will be a tough game, they’re a tough team one of the fancied teams and I expect them to be there or thereabouts. One to watch: Lenell John-Lewis. Striker is starting to come into some real goalscoring form for Newport now after taking eight games to hit the target. Since breaking his duck, the 26-year-old has gone on to net five in his last 11, including four in his most recent six. Started life at Lincoln, and has been at Bury and Grimsby before moving to Rodney Parade in the summer after scoring 18 goals for the Mariners last term. Played for both: Aaron O’Connor - Striker spent a season at Luton, making 39 games and scoring nine times, before moving to Newport in August 2012. Enjoyed three campaigns with the Exiles, netting 31 goals including three against Luton before leaving Newport in the summer and has since moved to Forest Green in the Conference, scoring nine times already. We’ve got form: Newport has never been a particularly happy hunting ground for the Hatters during their meetings stretching back to 1910s in the Southern League, Southern Alliance and old Division Three South. In 28 encounters, Luton have won eight, drawn six and lost 14, scoring 38 goals and conceding 51 times. Luton have scored four once, a 4-2 triumph in 1935 when Martin, Crompton, Stephenson and Ball netted. Hatters’ last win in Newport came back in November 2011, courtesy of Danny Crow’s last-minute winner. Last time out: Luton were beaten 1-0 at Rodney Parade on their visit last season. Former Hatter Aaron O’Connor netted the only goal on 21 minutes and despite hitting the woodwork through Elliot Lee, Hatters couldn’t reply. Hatters: Elliot Justham, Michael Harriman (Fraser Franks 52), Jake Howells, Luke Wilkinson, Steve McNulty, Alex Lawless (Nathan Oduwa 72), Andy Drury, Luke Guttridge, Cameron McGeehan, Mark Cullen (Paul Benson 61), Elliot Lee. Subs not used: Craig King, Matt Robinson, Ryan Hall, Jayden Stockley.